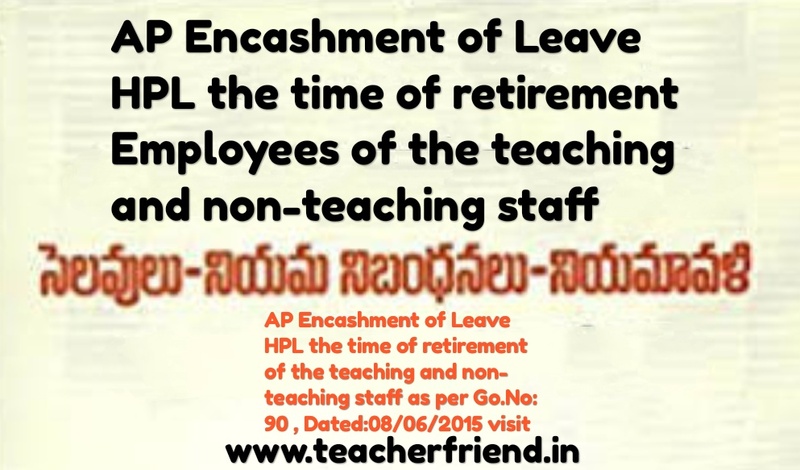 AP Retirement of the teaching and non-teaching staff LEAVE RULES Encashment of Leave on Half Pay HPL Leave at Working in the Aided Junior Colleges / Degree Colleges / Oriental Colleges and also for teaching and non-teaching staff working in PR, Municipality and Aided Schools with retrospective effect Orders Issued as per G.O.MS.No. 90, Dated: 08-06-2018/AP LEAVE RULES Encashment of Leave on Half Pay at the time of retirement of the teaching and non-teaching staff working in the Aided Junior Colleges / Degree Colleges / Oriental Colleges and also for teaching and non-teaching staff working in PR, Municipality and Aided Schools as per G.O.MS.No. 90, Dated: 08-06-2018. G.O. Ms.No.154, Finance (FR.I) Department, Dt. 04.05.2010. G.O. Ms.No.148, Finance (HR.IV) Department, Dt. 21.08.2017. G.O.Ms.No.186, Finance (HR.IV) Department, dated.27.11.2017. Orders of Hon’ble Andhra Pradesh Administrative Tribunal in O.A. No. 6775/2014, O.A.No.323/2017, dated. 10.02.2017and 652 of 2018, dated. 11.04.2018. Several Representations including representations of Sri Gade Srinivasulu Naidu, Sri Rama Surya Rao, Dr.A.S.Rama Krishna, Sri Balasubrahmanyam, and Sri Kathi Narasimha Reddy, Hon'ble Members of A.P. Legislative Council. 25th September, 2008. The Ninth Pay Revision Commission recommended to adopt the same formula in the case of encashment of leave also subject to the condition that the total number of days of earned leave + leave on half pay put together should not exceed 300 days for encashment. Accordingly orders were issued in G.O.Ms.No154, Finance(F.R.I) Department, dated:04.05.2010. 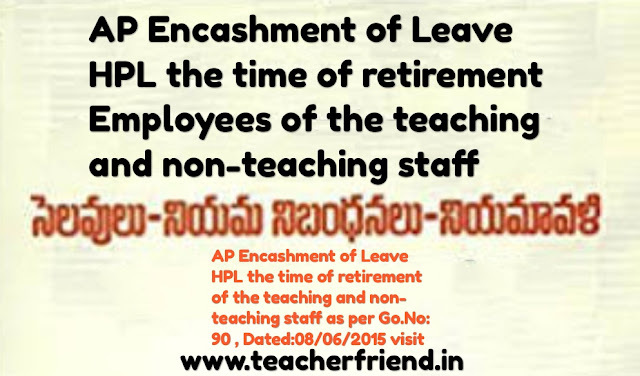 AP Encashment of Leave HPL at the time of retirement of the teaching and non-teaching staff as per Go.No:90.
and local bodies i.e., Aided Junior Colleges/ Degree Colleges/Oriental Colleges and also for teaching and non-teaching staff of Aided Schools and the employees of Panchayat Raj and Municipal institutions. Department, dated: 4-5-2010 with all consequential benefits”. extending the orders issued in the reference first read above to the teaching and non-teaching staff working in the Municipal, Panchayat Raj and Aided Institutions on par with the Government employees. In the reference third read above, the same facility was extended to the teaching and non-teaching staff of Aided Junior Colleges/Degree Colleges/Oriental Colleges and also for non-teaching staff of PR, Municipality and Aided Schools on par with the Government employees. Government to implement the orders of Hon’ble APAT with retrospective effect i.e. from the date of issue of orders in the reference first cited.